Dress up your engine compartment with a beautiful chrome plated alternator/air conditioner bracket from Mr. Gasket. 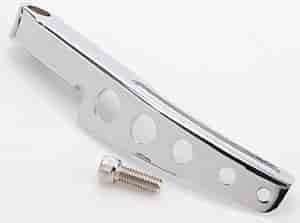 Similar in design to OEM units, these brackets are made from heavy gauge steel, polished to a high luster, then chrome plated for lasting beauty. Though designed for specific Chevrolet applications, they can be adapted for use on other engines as well. Does Mr Gasket 5177 fit your vehicle?